One of my favorite time of the year: the cooler weather, beautiful trees, hot apple cider, pumpkin pie, holidays approaching….but wait: what about the house? It is easy to get caught up in this busy season and to neglect to prepare your home for cooler weather. Here is a quick checklist to help you prepare your home for the fall and winter months so you can enjoy your holidays. For windows, Check for loose or cracked glazing. Re-seal with silicon caulk. All windows and doors should close snugly. You can winterize your windows if you need to wait to repair or get new windows. Also, seal holes or gaps where the house framing meets the foundation. This is more of a tip than a maintenance issue. Open your shades in the daytime to let the sun shine in your house. Close your shades when the sun sets. The idea is to use the sun’s warmth to heat up for home a little. An easy way to remember this is to check your smoke detectors and batteries every time daylight savings ends or begins. You should check your smoke detectors every 6 months. Shut off the water to the outdoor faucet. Drain your garden hoses, wrap them nicely and put them in storage. Schedule a maintenance check for your HVAC system or schedule a chimney clean. 7. Light up your outside. It will be getting dark out, so it is important to have proper lighting along the pathway to your house. Also, inspect your porch lights. If you need help upgrading your porch lights, or smoke detectors, feel free to give us a call. Thinking of redesigning a bedroom? Here are some ideas on how you may want to light your room. This is obviously a popular choice because of the dual purpose. Having one fixture that provides light and keeps the room cool is a very practical choice. They are many different styles to choose from. Our recommendation: buy a fan that comes with a remote control. 2. Old fashioned floor lamps. If you don’t already have a light fixture installed and currently do not want to get into a electrical project, this is a great option. Again, the styles are endless. Picking out a floor lamp can be a lot of fun! Our recommendation: If you are using the lamp mostly for reading, get a lamp with an adjustable head. If you are using the lamp the mainly provide light for the room, choose a floor lamp with the bulb facing upward. A Chandelier can bring so much beauty and character to a bedroom. However, these work best with higher ceilings. Our recommendation: Go with a more simple smaller fixture rather than a traditionally large one. Pick a chandelier that casts a soft moderate light. Some chandeliers can be very bright that may be too much for a relaxing bedroom. This is personally my favorite! You can space out these lights to make it bright as you desire. Plus, they work on both high and low ceilings. It has a very clean, contemporary look. And you can get a remote control for them. (We have one in our bedroom). Our recommendation: Get a good dimmer along with these lights. And do not forgot the closets: recessed lighting is great for small spaces too! Everyone needs a bedside light, right? Of course there is the famous bedside lamps. They are great if you have an adequate nightstand space. Bedside lamps are cheap and can be very pretty. If you do not have much space or want to eliminate clutter, consider wall sconces. They look really nice and helps free up space. We had them in our living room for light reading at night. Our recommendation: Get a wall sconce with adjustable arms for reading. Make sure the fixture is reachable from your bed to adjust. We are happy to install any kind of bedroom light fixture. We give out free estimates if you are considering new lighting. Determine whether you are adding a new porch light or replacing an existing one. If you are replacing a porch light, your options are limited. For example, if you are replacing a wall light, obviously you will be seeking to get another wall light. If you are adding a new porch light you have options such as wall lights, ceiling lights, or even recessed lights. Figure out your size and placement. Pick a porch light that performs that purpose that you have in mind. Are you getting a porch light for decorative purposes only? Are you looking for a bright porch light? Do you want a porch light with a timer or motion sensor? Will the light get wet in the place that you are planing to install? These are some question that need to be considered. You may find a porch light that is really pleasing to the eye but it may not be as bright as you need. Make sure the light is function-able to your needs. If you are a handy person, you may just want to install the light yourself, especially if you are only replacing it. Or hire a local electrician. He may be able to help you decide the placement and the kind of porch light. If you live near Quakertown Pa, feel free to give us a call. We give free estimates and would be happy to help! After a few long, hot, and steamy showers, you notice the ventilation isn’t the best in your bathroom. Poor ventilation in a bathroom can led to mold, mildew and can even start to damage your drywall. This is where a exhaust fan comes into play. What kind of fan should you install? Here are some things to consider….. Size. First, you need to know what size you will need. Bathroom fans should have 1 CFM (cubic feet per minute) for every square foot of floor space in the bathroom. In other words, if your bathroom floor area measures 70 square feet, choose a fan with at least 70 CFMs to get the right amount of ventilation. Ceiling-mounted fans are installed in the ceiling and vent into the attic or out through the roof. Wall-mounted fans are mounted on the external wall of the house and generally are used when there is no practical way to vent through the roof; for example, a first-floor bathroom. Remote fans have a fan unit located in a remote location such as the attic; duct work connects the fan to an opening in the bathroom ceiling covered by a grill. Inline fans are often used in homes where one fan vents multiple bathrooms, or to have multiple vents in one large bathroom. Once have you the necessary exhaust fan the fits your bathroom’s needs, here are some details you may want to look into…. Noise Level: Fan noise is rated by sones—a scale that represents degrees of loudness. A rating of 0.5 to 1.2 sones means the fan is exceptionally quiet. Ratings of 1.5 to 2.0 sones is very good. Fans rated in excess of 4.0 sones tend to be noisy. Fans with heaters: This adds a little extra warmth for those chilly days. Lighting: some fans come with overhead lighting. Night light: equipped models use a low-wattage light to help you find your way in the dark. Built in motion sensor: turns on the fan when someone enters the bathroom. The fan speed can be pre-set to a low volume to remove the moisture of everyday tasks, such as shaving, and switch-activated for high-volume tasks, such as showering. If you are thinking of installing an exhaust fan, feel free to contact us if you are in the Quakertown, Pa area. We will be happy to give you a free estimate. It’s that time of the year: real estate sales start going up and home projects start again. Maybe you are thinking of buying or selling a house. Or perhaps you may be adding an addition. There are times when an electrical inspection may be needed. However, here are some electrical inspection tips. Here is a checklist on things you can check yourself and hire to get fixed before you hire an inspector. This an easy one. Simply, do the smoke alarms work? Is there a smoke alarms in both upstairs and downstairs? Some cities require you have one in each bedroom as well. You can call your city or look on the website to find out their smoke detector requirements. Does it have a cover? Do any of the breaker feel loose or warm? Are there burn or charred marks? Does the panel as a whole look damaged? First, check the outlets that are near wet areas such as the kitchen or the bathrooms. Are those outlets a GFCI (which is what you will need). Next, make sure all your outlets–and switches– have covers. If you see burn marks near any outlets, you have a problem. This may be obvious, but make sure you don’t have any loose wires hanging from the ceiling or other places in the house. However, don’t forget the check the outside. If you have any overhead wires that connect to the home, make sure your tree branches are cleared from these wires. This is just a basic list that you can quickly go over yourself to decide if you need to hire an electrician before hiring the home inspection. If you need some electrical services or want an electrical take a look at you home, feel free to contact us. SHORT ANSWER: YES. They save on electric ( they only use 10-15% of energy an AC would use) and they are worth the investment. BUT they aren’t efficient in every home. How an attic fan works: Usually a whole-house fan is mounted in the attic floor, above a grille in the ceiling of a prominent hallway. Once the outdoor temperature cools down — usually in the evening or early morning — the homeowner opens a few downstairs windows, and turns on the fan. The fan pulls air from the hallway and blows it into the attic. Since attic fans are relatively powerful, they quickly exhaust the hot indoor air, allowing cooler outdoor air to enter through the downstairs windows. On average, attic fans can cool down a house in less than an hour. Once the house has cooled off, the fan can be turned off and the windows closed. The idea is to close the windows after the fan is off (early morning until evening) to trap the cool air inside. This method is an alternative instead of using air conditioning. For an attic fan to work, you NEED to have the windows open. For someone that suffers from allergies, an attic fan may not be a good fit. Attic fans use only about 10%-15% of energy that an air conditioner would use. This will save costs on your electric bill. Your attic needs to have good ventilation sysytem. The attic fan needs a way to circulate air out of the attic. For proper cooling at night, the temperature outside needs to be 80 degrees or lower. Although, using the attic fan in the spring or fall is another option if the summer nights get too warm. Keep in mind, attic fans will not remove the humidity in the air if humidity is a concern. Attic fans can cool down the house fast at night (an hour or less) and it is a great alternative for those who want to save on cooling costs, but want to stay cool at night. Attic fans aren’t for everyone, but it can be a great alternative after the above points are considered. Spring is coming!! When you think of spring and your home, you may think of spring cleaning. However, besides cleaning, there are a lot of items to check to make sure your house is in top shape. Here are some few ideas on what you may want to check up on. Check your windows. Check for any air leaks (you don’t want your cool air from the AC leaking out, right?) Also, check you screens: do they have any holes? If you have a screened in porch, check those screens as well. Check your ceiling fans Do they shake violently or make too much noise? If you change the direction of your fan for the winter, (to maximize your warm air flow), don’t forget to change the direction back. Also, now it the time to schedule installing a ceiling fan if you have been considering of getting one. Check you AC units or HVAC. Make sure your air works before it gets hot. And if you have an HVAC unit, don’t forget to change the filters. Check your smoke detectors. Change your batteries. A good way to remember is change your smoke detector batteries when daylight savings starts and ends. Check your roof and gutters Make sure your roof is in good order. And if you have a chimney, don’t forget to inspect it. Clean out your gutters and drain spouts. Check your sprinkler system Make sure they aren’t leaking and the sprinkler heads are working properly. Check your exterior siding and paint Check for mold growing on the side of your house as well as peeling paint. A power washing may be in order or a new coat of paint. Check your landscape lighting and porch lights Make sure all your outside lights are in working order. I hope you are excited for Spring and that you find this list useful. If you need any assistance that requires electrical work, feel free to contact us! We would be happy to give you a free estimate. Happy Spring! It creates more room. Say good-bye to plug in lamps. You won’t have lamps taking up the space. Furthermore, you won’t have lights hanging down from the ceiling. This makes a room look a little bigger. It is great for low ceilings. In low ceilings in where you have to worry about whether a light fixture will hang too low (you don’t want to worry about hitting your head), recessed lighting is a great alternative. It is perfect for shower stalls. Recessed lights are the only light that can be installed in the water-intensive environment. Better light and room coverage. If arranged and installed correctly, recessed lights can really add light value to your room and light it evenly. They are lightweight. Recessed wall and ceiling lights light enough that they do not have to be secured directly to ceiling joists or wall studs. They need very little support, which gives you more options in where to place them. They come in different colors so there are options to choose from when you are interior decorating a room. Recessed lights really bring a really nice, clean look to a room. If you are interested in a free estimate to install recessed lights, feel free to contact us. Do I need to upgrade my Electrical Panel? There are many reasons on why you should upgrade an electrical panel. 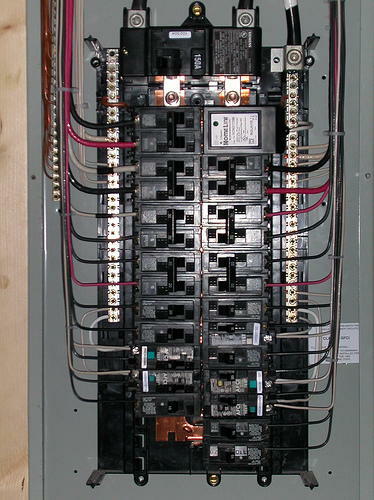 Your electrical panel is old – Electrical panels generally have a life span of 25-40 years. If you lived in your house for over 25 years and have not upgraded or just moved into an older home, it may be time to replace your electrical panel. If your panel still have fuses, you need an upgrade. Your circuit breakers trip regularly – Older panels are more sensitive to power surges. Also, you may have more appliances now than when the panel was installed. Your panel may need to upgrade to a higher amp. Your appliances aren’t running on full power – Again, this may be a sign that your panel needs an amp upgrade. You panel smells – If you smell a burning smell, you could be at risk for an electrical fire. Your insurance requires it – Some homeowner’s insurance have requirements for electrical panels in ordered to get the correct coverage. You are doing a home renovation This may be a great time to upgrade. Especially if you are doing an addition and added more appliances. If you are not sure if you need an electrical panel upgrade in the Quakertown or surrounding area, feel free to contact us. We can give you a free estimate. Overloads. This is the most likely cause and what your electrician will probably investigate first. That means you’re running too many heavy power consuming devices at the same time on the same circuit. Breakers have a limit of power to supply to your appliances and home. If this is exceeded, (you have a 15 amp circuit but has 20 amp of electricity running through it); the breaker will trip. Short circuiting. This is more dangerous than an overload. What is happening is that a hot wire is touching or having contact with another hot or neutral wire. Check your outlets. If you see blackening around the outlet or smell burning, you are experiencing short circuiting. Short circuiting happens for many reasons such as a loose connection or incorrect wiring. Do not attempt to mess around with your outlet at all. Leave the breaker tripped, and call in an electrician right away. Ground fault. This is almost like short circuiting. Instead of the hot wire touching another hot wire, this time the hot wire is touching a ground wire or the metal outlet box. The grounding of that outlet is no longer effective and is considered dangerous. Again, don’t try to fix, call a professional. Appliance failure. Sort of like an overload, the problem is specifically the appliance rather than having too many running at the same time. The appliance can be faulty or damaged and draw more power than it should causing an overload. If your breaker has issues tripping, check the appliances related to that breaker. If you need help inspecting your breaker if it keeps tripping, feel free to contact us for a free estimate!